Soon is the beginning of a new year according to the Jewish calendar. 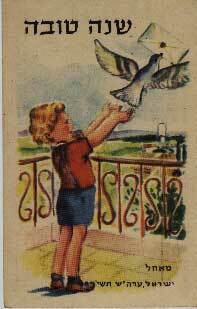 Everyone is greeting each other here with “Shana Tova” – May you have a good year or plainly saying: “Hag Sameah” – Happy holiday -Say Shana Tova to everyone you speak to. Rosh HaShanah literally means “Head of the Year” in Hebrew. It falls in the month of Tishrei, that is believed to be the month in which God created the world. Hence, another way to think about Rosh HaShanah is as the birthday of the world. The shofar is an important symbol of Rosh HaShanah. It is an instrument often made of a ram's horn and is blown one hundred times during each of the two days of Rosh HaShanah. The sound of the shofar blast reminds people of the importance of reflection during this important holiday. Learn more about the shofar in this article. Tashlich is a ceremony that usually takes place during the first day of Rosh HaShanah. "Tashlich" literally means "casting off" and involves symbolically casting off the sins of the previous year by tossing pieces of bread or another food into a body of flowing water. Learn more about tashlich in this article. Rosh Hashanah meals usually include apples and honey, to symbolize a sweet new year. Various other foods with a symbolic meaning may be served, depending on local minhag ("custom"), such as cooked tongue or other meat from the head of an animal or fish (to symbolize the "head" of the year). Foods consumed with the Yehi Ratzons vary depending on the community. Some of the symbolic foods eaten are dates, black-eyed beans, leek, spinach and gourd, all of which are mentioned in the Talmud. Pomegranates are used in many traditions, to symbolize being fruitful like the pomegranate with its many seeds. The use of apples and honey, symbolizing a sweet year, is a late medieval Ashkenazi addition, though it is now almost universally accepted. Typically, round challah bread is served, to symbolize the cycle of the year. Gefilte fish and Lekach are commonly served by Ashkenazic Jews on this holiday. 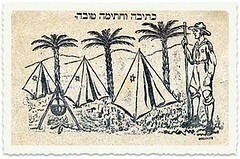 On the second night, new fruits are served to warrant inclusion of the shehecheyanu blessing, the saying of which would otherwise be doubtful (as the second day is part of the "long day" mentioned above). 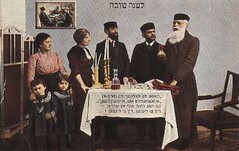 Other symbolic foods are eaten in a special Rosh Hashanah Seder, particularly in the Sephardic and Mizrahi communities. Symbolic foods are eaten in a ceremony called the Yehi Rasones or Yehi Ratzones. Yehi Ratzon means "May it be Your will", and is the name of the ceremony because it is traditional to eat foods symbolic of a good year and to recite a short prayer beginning with the Hebrew words "Yehi Ratson" ("May it be Your will") over each one, with the name of the food in Hebrew or Aramaic often presenting a play on words or pun in Hebrew or Aramaic. The foods eaten at this time have thus become known as "yehi ratsones". Typical foods, often served on a large platter called a Yehi Ratson platter, eaten by modern Sephardic Jews include apples dipped in honey, or baked or sometimes in the form of a compote called mansanada; dates; pomegranates, or black eyed peas; pumpkin in the form of savory pumpkin-filled pastries called rodanchas; leeks in the form of fritters called keftedes de prasa; beets usually baked and peeled; and the head of a fish: usually a fish course with a whole fish, head intact. It is also common to symbolize a year filled with blessings by eating foods with stuffing on Rosh Hashanah such as a stuffed, roast bird or a variety of stuffed vegetables called legumbres yaprakes. A major significant symbol of Rosh HaShanah include the apples, honey and round loaves of challah. Apple slices dipped in honey represent our hope for a sweet new year and are traditionally accompanied by a short prayer before eating that goes: "May it by Thy will, O Lord, Our God, to grant us a year that is good and sweet." Challah, which is usually baked into braids, is shaped into round loaves of bread on Rosh HaShanah. 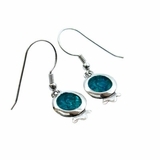 The circular shape symbolizes the continuation of life. 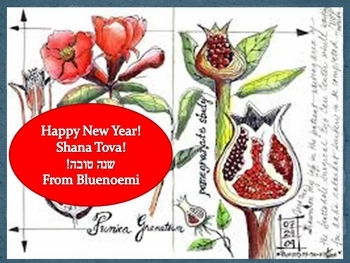 Some people choose to send New Year’s greeting cards on Rosh HaShanah. 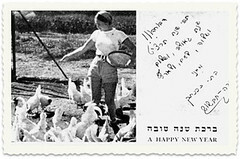 Before the advent of modern computers these were handwritten cards that were snail mailed weeks in advance, but nowadays it is equally as common to send Rosh HaShanah e-cards a few days before the holiday. So here is our wishing for our readers and friends Shana Tova. We also want to hope that this will be a good year for Israel the Palestinians and the Arab neighbours. Neither side will have a good year alone. 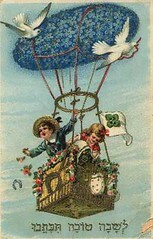 It could only be a happy year for both people or it won’t be a good year for the both. 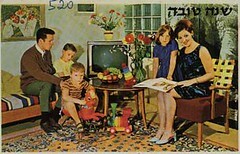 Once there was a tradition to send Shanot Tovot – special greeting cards for the new year, today you usually get e-cards instead. 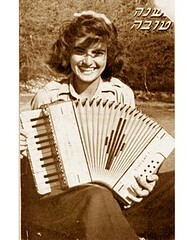 Anyway we will present here with all kinds of different old Shanot Tovot for the nostalgic souls.